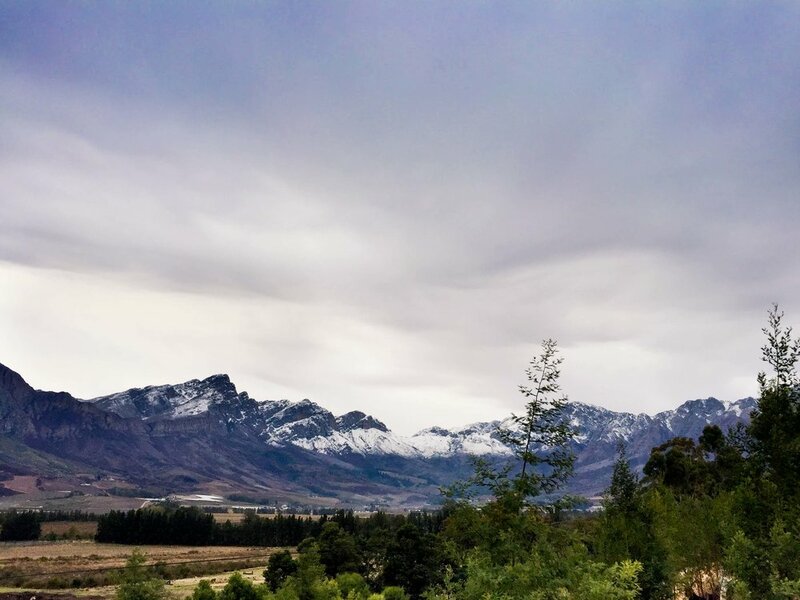 Having survived what the media were punting as the "storm of the century", we were pretty excited to get out of Cape Town and head to the Tulbagh for the weekend. We heard that the small farming town had got hit hard by the storm and we weren't sure if were going to spend the weekend in the dark with no electricity. However, just before we set off the owners of the accommodation assured us that we were safe. Not concerned about the cold weather, we headed off. We arrived in Tulbagh greeted by white snow capped mountains and it reminded me of why I love this place so much. Surrounded by mountains on three sides in a horse shoe shape ,Tulbagh is a truly beautiful town. The valley inbetween is home to beautiful wine farms. Most have accommodation and almost all offer some sort of wine tasting, which was why we were here. Why else? We were meeting "The Winemaker" and his wife along with "the Jewley maker" and her man, who both promised that there would be enough booze to keep us warm. So, I decided to bring some extra beer, Gin and some wine of our own as well. Can't be too safe. (When we all arrived I realised we had enough wine to take down a small army of bored housewives.) I think it was safe to say we were not going to have a problem keeping warm. The rain couldn't keep us down and as we drove up to the Sunburst Cottage, about 10 mins out of town we knew we had made a good choice. Just look at the view from the cottage the next day. The cottages form part of the Bergsicht group of accommodation. With a few to choose from, (some in the centre of town), Sunburst sleeps six, comes with a pool, fireplace inside and a braai place outside to go with the firepit. It includes two bathrooms (one share between two of the rooms) a full equipped kitchen and a TV with DSTV (although we never turned the TV on). The balcony overlooks the Winterhoek mountains which, as I said, were covered in snow at the time. It's a truly beautiful place. Only later did I discover that one of the other cottages had a woodfire heated pool. I mean come on, how could we not have organised that? Lets just say next time you know were we will be staying. Once we all had arrived and settle in to out wine drinking regime for the night, the owners stopped by to say hello and make sure we were ok (we were) and check if the electricity was all good (it wasn't). Although we had electricity, every time we turned on the fridge the whole house tripped. But to be honest we weren't phased at all. Cooler boxes for the food to the rescue. And as long as we had red wine were were happy, and we had a lot of it. The owners were friendly, happy and very apologetic about the electricity but we convinced them we were more than happy and that there was nothing they could do and they shouldn't worry. We nearly got them to stay and have a few drinks with us, which the husband was happy to do until his wife reminded him that he had is mother staying with him over that weekend. He put his glass of wine down and apologised again and assured us that any other time, he would have settle in for a few brandy's with us. It's so nice meeting happy and friendly people. The next day we nursed our hangover by going wine tasting. As you do. So in the pouring rain we arrived at Sarensberg wine farm. Another beautiful place with amazing wine. With the girls settled in around the blazing fireplace, we signed up to do the full tasting and it didn't disappoint. Jean "The Winemaker" and I got stuck in to everything. Jack was feeling sorry for himself and got lost in the art gallery upstairs. (He might have fallen asleep on one of the benches but this isn't confirmed) It's always great doing a tasting with a wine maker. He adds so much knowledge that you learn to appreciate the wine a lot more. Even though we wanted to move onto Twee Jonge Gezellen (which has to have one of the most beautiful views from their tasting area I have ever experienced) to sample their amazing Champagne Krone, we decided to rather go have some lunch as time was getting away from us. Now if I have I fault with Tulbagh is that their pub/bar situation is a bit on the bleak side. Having said that their are some very cool restaurants that make up for it, including Things I love, Readers Restaurant and The Bulgian Kitchen. We ended up settling for the Tulbagh Hotel and their famous Olive Terrace and then later went to the infamous Bush Pub to watch the rugby. Both times I have watch South Africa play from the Bush Pub I am always amazed that they always seem to have so much space, yet no tables and chairs for people to watch the rugby on the big screen. Half the people who arrived leave because they have no where to sit. All I can say is if they brought in a few extra tables, the place would have been packed. Nevertheless, the guys soldiered on and watch SA win and the girls went home to "get the fire going". We had another brilliant night with the wine pouring as much as the rain. All huddle around the fire, not even the electricity problems could get us down. If you are looking for a great weekend away for a reasonable price, Tulbagh will always be on the top of the list for me. It takes about an hour and a half to get their and most of the accommodation is cheap everything is close and quick to get to. Oh and remember the wine farms! I have no doubt in my mind we will be back again (we have visited Tulbagh at least five times over the last couple of years). Although next time it will either be with the woodfire heated pool or to the amazing camping site Secret Falls. It’s on our wish list.